We are delighted to be a Winner in the People Driven Digital Health Awards which were held in Leeds on Friday 3rd July. These awards were instigated to recognise the work of digital health innovators from across the UK and aim to connect the people who have ideas and make them happen. The event was organised by mHabitat and compered by a well known health commentator, Roy Lilley, of the Academy of Fabulous Stuff. The evening was full of fun and energy and we met lots of interesting people and made good connections. There is loads going on in digital health and services should make use of all these fabulous innovations that will improve people’s lives and health services. To get a flavour of the evening follow #PDDAwards15 and to find out about the other winners click here. 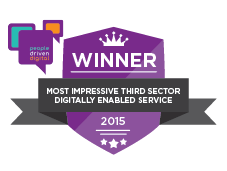 Our category, ‘the most impressive third sector digitally enabled service’ recognises third sector services which have embedded digital tools and services into improving people’s experience and outcomes. We very honoured to win this category with our digital Talking Mat. The announcement of the winners was followed by a flurry on Twitter which you can dip into here . This entry was posted in App, Blog, Communication difficulties, Digital Talking Mats, Event and tagged App, Communication difficulties, digital, Talking Mats on July 7, 2015 by Joan Murphy.